In March 1984 a new door opened for me regarding British wildlife, or perhaps I should say 'local' wildlife, and animals living in Dorset. I have always lived in the county. Having been born in Bournemouth, I am fortunate enough to have lived in some of the county's most beautiful and famous countryside namely along the Stour valley and Blackmore Vale, and the southern part of Cranborne chase. I became fascinated with animals as soon as I could walk. I spent all of my time poking around for various insects and reptiles. I started watching mammals at the age of six feeding wild rabbits with carrots, or watching foxes dashing across a field, woodpeckers in the ash trees. I was a loner from that early day’s having suffered a traumatic early childhood, and put into care, I was denied the normal kind of childhood, and was forced to grow up quickly. I became attuned to the sights and sounds of the natural world around me, perhaps it was my only comfort, and I certainly felt at home there, alone in the woods and hills, although I always felt lonely inside, the gift that mother nature gave me cannot be artificially replicated, and it substituted the normal love my family should have given me. My hearing became attuned to high and low frequency sounds, my eyesight became like the buzzard’s. I would spend hours marvelling. At school I would spend most of my time rummaging in hedgerows when my friends were playing typical kid games. I taught myself a wealth of knowledge of which only grew with every outdoor experience. At the age of fifteen I even took my biology teacher and her fiancé badger watching and took village children out to watch all manner of wildlife. Living in the shadow of Okeford hill with Hamledon and Hod Hills opposite, much wildlife entertained me. Badgers, deer, raptors, snakes fishes and insects and orchids filled my life with a wealth of adventure. Daytime wildlife watching was not enough and I spent more and more time out at night watching nocturnal animals, with no modem night vision equipment, my eyesight became adjusted to night vision .I set out amidst the hills far away from the humans I mistrusted, with the moon for companionship and the sounds of nocturnal animals I started to see a new world. A world of seemingly impossibilities I thought I had seen most local species of wild animals, but nothing prepared me for what I started to see during these longer nocturnal wanderings. I decided to visit a badger sett on the river bank under Hod hill, of which had been subject to part destruction by the land owner, I had visited it a week previously and had been horrified to find half of the old oak and ash trees felled. It was an old bluebell wood and the sett comprised of around sixty used entrances with another hundred or so filled in naturally. There was a lot of badger baiting going on locally and I was also trying to catch the culprits. I set out during a gale, and a full moon. One thing I had learned was that on such stormy nights, wild animals fail to acknowledge ones presence, due to loss of. Little did I know that those tactics was also used by a very witty predator? I had just finished walking along the old disused railway line and turned into the field, which was now maize stubble and scanned the edge of the wood for any life. A small badger was making its way towards me at about two hundred yards or so. I half lent, half sat against an old elder in the hope that the animal would come all the way along and pass me. It was taking its time and often rummaging for worms in the soil, so I decided to use my torch to scan the rest of the field to see if there were any more at the far end they do not seem to mind torch light swept along slowly, as it mimics car headlights As I did so, I caught reflective eye shine of an animal, quite nearby, facing in the direction of the badger. At the same time I could also see a shape not that associated with badger, fox or deer, but something altogether different. It was too large for a fox, yet it moved like a predator when I aimed the beam at it, it slunk to the ground and faced me, with yellow white reflection. I knew fox to be pink/white. And every time I moved the beam away, it would get up and run very fast. Intrigued, I paced off in hot pursuit and as my beam was on it, it had slunk down so I was able to get within twenty or so yards of it. It was then that I realised that the animal was not one of the usual species of animal I was used to watching. In front of me crouched a cat, a very large cat the size of a golden retriever. It had a very thin long tail that swept down, before up again. It looked uniform in colour, a light yellow tan. At the point when I thought that I could not get any closer, it leaped long ways covering several meters and ran the rest of the large field in next to no time, all the while I had the torch beam on it so I could see it very clearly, when it reached the high barbed wire fence it leaped vertically the full five feet so effortlessly, I was amazed. At the point the cat vanished there was nothing. 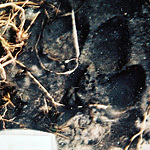 Not a sound and not even a paw print for me to examine, even the next day I scanned the whole field. It was not damp enough. I then had to collect my thoughts as I was in mild shock, knowing that I had just witnessed what looked like a 'puma' which could only have been stalking the badger. The badger had by now reached the railway track and was out of sight. I suddenly thought about the stories I had read about the beast of Dartmoor and Exmoor.' Wow have I just seen the same sort of thing’? I hadn't disbelieved the tales, or had taken much notice of them, but it suddenly opened a new dimension, which was absolutely thrilling. I rushed home, all the while wondering what to do about it, who I should telephone 'the R.S.P.C.A? No surely not. 'A hundred thoughts were going through my head at the same time. I was pumped up with adrenalin, and when I got home I telephoned a naturalist friend and teacher who I presumed would know what to do. He did not take me seriously, and would regularly take the mickey, whenever we were together doing conservation work, or bird watching. After that disappointing introduction, I didn't bother telling anyone else from fear of ridicule. I just kept these secrets to myself. I obviously needed to find out as much as possible. I was under a year away from leaving school and did not want to do a full time job, but I did my morning paper round , and did gardening jobs in the village. After every tea time, I was off, forgetting my many school friends and pretend girlfriend. I just wanted to be in the wilds away from society away from the barking dogs and cars. When I was in the hills, I was different. I was a wild animal. I was one with nature. I would trot like the fox , bark like the dog fox, wicker like the badger, hoot like the owl, I would cat wild mushrooms raw, and chase rabbits and pigeons, sometimes catching them and feeding them to my pet ferret. I knew all the badger setts in the area and how many individuals lived in them. Some badgers got used to me and one would play games with me, by trying to take my shoe off. Many would not flee at my approach, and many a fox entertained me no end. It is strange what happens when one partially disconnects oneself from humanity. One learns things that are usually denied folk. I gained an utter respect for nature and how great it was. How animals are like us and us like them. I started to realise that we humans are destroying the planet, and I did not want to be part of it . I was also getting used to the various smells animals make and would often get fox Mixed up with another unknown beast, because it did not exist not yet anyhow. I sometimes found scats that looked like giant fox, It was a bit confusing. It was now may, the hawthorn was in full bloom. I decided to visit my favoured place which was the chalk quarry, on the hill side. I wondered whether or not the buzzards were nesting in the dwarf oaks, or whether or not the turtle doves in the blackthorn.